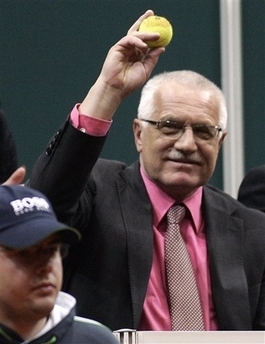 Czech President and tennis fanatic�Klaus is the only world leader who has been bestowed the honor of being�named an Honorary Member of Maggie's Farm. I am... in favour of redefining the whole concept of the European Union. Maybe in 2009, between Klaus in the Czech Republic, Poland, and U.S. President Fred Thompson, we might be able to shift the axis of the world back slightly towards true democracy rather than the tyranny of Sorosization and the Party of the jackasses. Europe might be OK after all. it's a ways outta the woods though. "I am... in favour of redefining the whole concept of the European Union. To summarize, I want freedom in Europe, not democratic deficit, I want democracy in Europe, not postdemocracy." "Postdemocracy" means fascism with make-up. All this will die in the crib if we elect the CPUSA's Hillary Clinton as US President. "All this will die in the crib if we elect the CPUSA's Hillary Clinton as US President." Possibly. Another possibilty is that if she is elected, it will ultimately spark the second Civil War. Did you hear her latest speech? God help us. Raw class-warfare. You got that right Buddy re her last speech. Straight out of the socialist playbook...life isn't fair...whine, whine. "Thou shalt Covet" is her message.